Turkey Vultures soaring over La Paz airfield are our first birds, ticked even before we collect our luggage from inside the terminal building! Cool, wet and windy weather under a typically grey British winter sky is not what we expect in Mexico’s Baja California, but never mind, the choppy bay outside the hotel is dotted with rafts of American White Pelicans, bobbing like flotillas of small fishing boats on the English Channel, while mighty Caspian Terns fly to and fro, just offshore, unperturbed by the stiff breeze. The White Pelicans are joined by a few Brown Pelicans and a whole host of other water birds, many at close range, including Great White, Snowy and Reddish Egrets, Great Blue and Tricoloured Herons, Yellow-crowned and Black-crowned Night-Herons, White Ibis, Double-crested and Neotropic Cormorants, American Oystercatchers, Avocets and Wigeon, Semi-palmated Plover, Long-billed Curlews and Dowitchers, Marbled Godwit, Willet, Greater Yellowlegs, Spotted Sandpiper, Laughing, Ring-billed and California Gulls, Belted Kingfisher, Osprey and the bizarre Black Skimmer, with Magnificent Frigatebirds patrolling menacingly overhead. Meanwhile, the adjacent garden produces White-winged Dove, Northern Mockingbird and Cactus Wren, plus Chipping, White-crowned and House Sparrows! 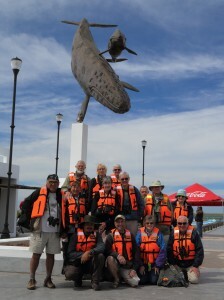 After more rain in the night we arise to a clear blue Californian sky, with no wind to ruffle the sea; ideal conditions for exploring the Sea of Cortez. Just half an hour out of port, we idly cruise alongside a majestic Whale Shark, the world’s largest fish, and yet at about twenty feet long this one is just a ‘baby’! Nourished soley by microscopic plankton, they are able to grow to a humungous 36 feet in length during a 70 year lifespan! In such shallow transparent turquoise water we can clearly see the ocellated pattern on this dark gentle giant as it moves slowly forward just below the surface; definitely one of the most remarkable wildlife spectacles I have ever seen! 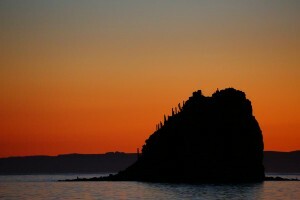 We reach a beautiful secluded bay, enclosed by the cactus-clad slopes of Isla Espiritu Santo, in time for lunch, with Royal Terns flying by. This afternoon, a festering bag of old fish provides a feast for Yellow-footed Gulls and Black Storm-Petrels which seem to appear from nowhere and then disappear again in the vast expanse of this ‘small sea’. 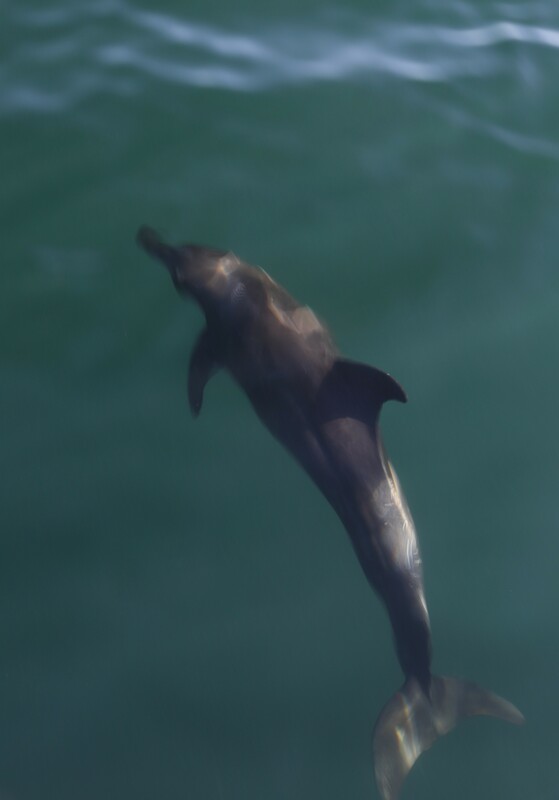 Returning to port, we encounter a pod of five Short-finned Pilot Whales, with snorting blow holes each time they ‘porpoise’ right next to the boat, before waving their tails prior to submerging on a deep dive. The action continues as the boat becomes surrounded by dozens of Bottlenose Dolphins, some leaping clear of the water, while others ride the bow wave of the boat, in water so clear we can easily see the abrasions along their bodies while looking down on up to five of these playful creatures at a time, taking turns to leap ahead of the boat and crash land with such power that they splash their cheering audience; a real “woo-hoo” experience, and a Manta Ray joins the fun by performing a full somersault next to the boat! This was a truly memorable day. This morning we leave La Paz, heading south along route 1 to a small marsh at San Antonio, where the main targets are Marsh Wren and Wilson’s Snipe. The Wren shows only fleetingly, but we pinpoint the Snipe in our scopes, along with a posing Black Phoebe and a Western Kingbird among plenty of Cassin’s Kingbirds. Moving on we arrive at the San Dionisio ranch in the Sierra La Laguna Biosphere reserve in time for a delicious al fresco lunch within yards of a tiny inconspicuous nest of tightly woven fibres, with a sitting Xantus’s Hummingbird, unperturbed by her audience. 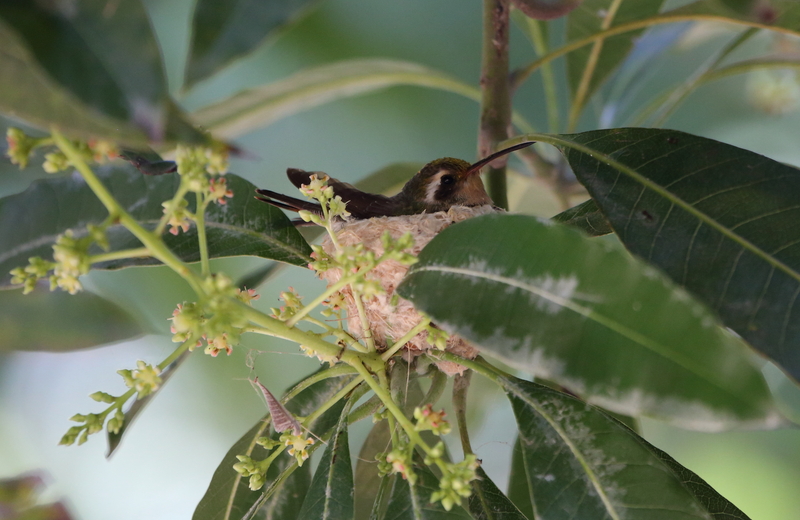 This tiny ‘hummer’ is endemic to this area! Once Josele has roused from his siesta in a hammock, we stroll to a beautiful valley with palm trees, tall cacti and a clear stream flowing between huge granite boulders, where sightings include Red-tailed Hawk, California Quail, Common Ground-Dove, Gila Woodpecker, Grey, Pacific Slope and Ash-throated Flycatchers, Blue-grey Gnatcatcher, Western Scrub-Jay, Cassin’s Vireo, Lesser Goldfinch, Wilson’s, Orange-crowned and Black-and-white Warblers, Western Tanager, Green-tailed and California Towhees, Black-headed Grosbeak and vivid yellow Scott’s and Hooded Orioles, while a soaring Zone-tailed Hawk is an uncanny resemblance to a Turkey Vulture. By now we are well accustomed to blue skies, as we explore a different part of the beautiful Sierra La Laguna. Although the birdlife is not high density here, we enjoy plenty of new sightings including the scarlet House Finch, the yellow-throated Audubon’s form of Yellow-rumped Warbler, fantastic close views of a handsome male MacGillivray’s Warbler, the beautifully marked Lark Sparrow and Spotted Towhee, a pair of stunning Northern Cardinals, numerous busy Acorn Woodpeckers, and the regionally endemic Grey Thrasher, singing from an open perch, it’s yellow eyes glinting in the sunshine. 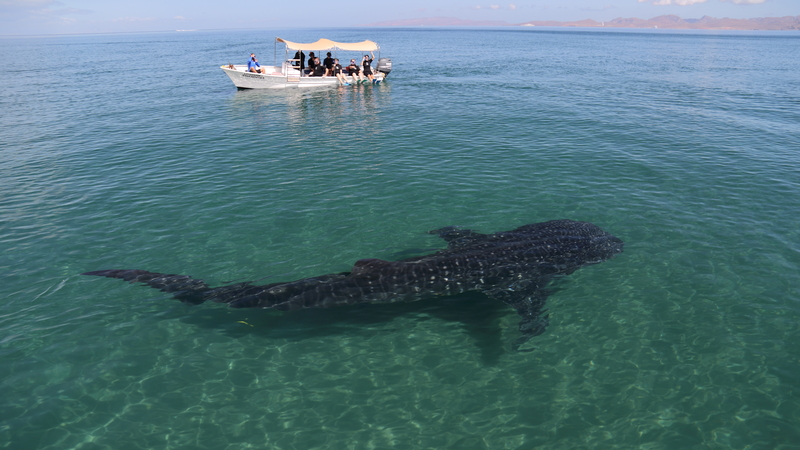 Today we leave ‘civilisation’ behind for an overnight trip to Espiritu Santo Island in the Sea of Cortez, but first we return to the ‘Whale Shark beach’ in wet suits, where we hope to snorkel with one of these spectacular fish. The water is not as clear today and so the first attempt is a washout as the shark glides by with only a fleeting glimpse, despite its gigantic size. Back in the boat, we track the shark for a second go and as soon as we are in the water, the guide shouts “face down” just in time for us to watch the huge shark pass directly below us just a few feet deeper, as if like a silent submarine, massive head first, which is wider than my open arms! Third time is lucky for me as I suddenly find myself swimming alongside the ‘sea monster’ at arm’s length! By swimming at ‘full throttle’ I manage to keep up with it as it glides effortlessly along, propelled by a long swirling tail fin, but I resist the urge to touch as this is not allowed. 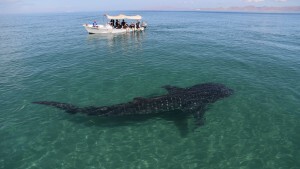 At such close quarters one can see the white markings on the dark body, several long gill slits, miniscule sucker fish hitching a ride on the pectoral fin and even the tiny eye. I eventually realise that I am being called back to the boat and so reluctantly let the shark disappear into the murky green plankton ‘soup’. Completely absorbed by the experience time becomes immeasurable, but those in the boat reckon I swam with the shark for about twenty minutes, so that’s one less thing on the ‘bucket list’! Next stop is on the island at Candelario camp, with tents set up along a sandy beach just ten yards from the high tide line, in a superb setting, with Turkey Vultures and a Red-tailed Hawk soaring around, and Brown Pelicans diving into the bay. After a lovely lunch, there is free time to enjoy this tranquil location, followed by exploration of the island by boat. Along the way we pass a Great Blue Heron nest, with a well grown chick and one adult, on a boulder below the cliff top, and a tightly packed raft of at least 80 Black-necked Grebes, repeatedly diving as one. Back on shore we visit an area of mangroves, providing perches for several Snowy Egrets, Yellow-crowned Night-Herons and a Tricoloured Heron, but our main target is the delightful Mangrove Warbler and we soon have a handsome yellow and green male with a rich rusty head perched and singing right in front of us. 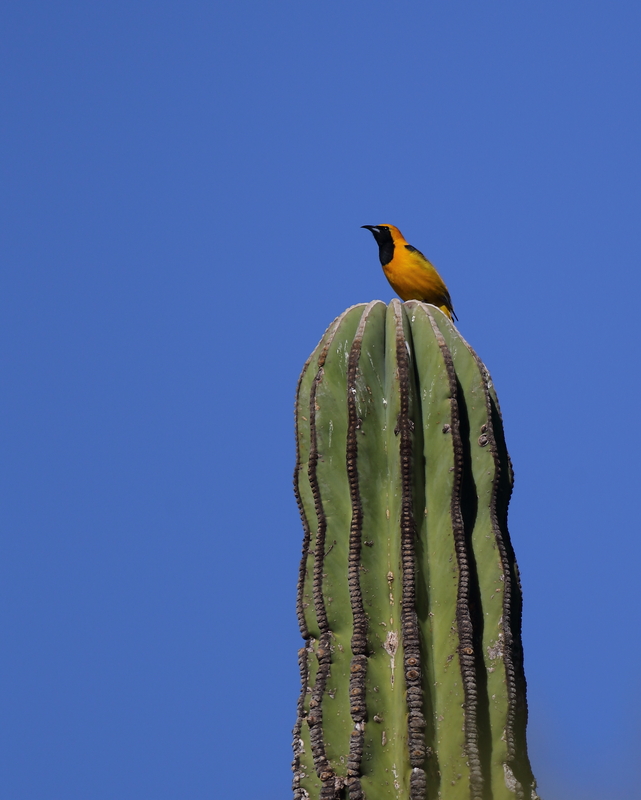 Meanwhile a diminutive Ladder-backed Woodpecker posing on the top of one of the many tall Cardon Cacti is a nice bonus. Returning to camp we arrive just in time to catch the sunset across the bay, whereupon a bright shining Venus appears in the afterglow. It’s now ‘happy hour’ and Margaritas are served, followed by a tasty barbecue accompanied by red wine and a lot of laughing and joking. With no light pollution, this is the perfect place for marveling at the billions of stars and the Milky Way scattered across the black sky, while listening to the waves gently lapping on the beach with a strange phosphorescent twinkle. Early birds this morning include smart Black-throated Sparrows, the incongruous sight of a Raven sitting on the top of a cactus, eight Least Sandpipers, so well camouflaged on the grey sand that we almost walk past without noticing them, and superb close views of the lovely little Verdin, with a yellow-green head and chestnut shoulder patches, but sadly no sightings of the singing Canyon Wren. 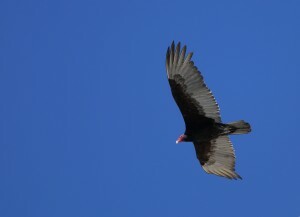 By 8am it is warming up nicely and numerous Turkey Vultures are spiraling on thermals rising up the rocky slopes. It’s now time to board the boats and visit Los Islotes, a couple of rocky islets whitewashed by Blue-footed and Brown Boobies, and home to a noisy colony of California Sea Lions, which seem to enjoy chewing the flippers of their snorkeling visitors! After lunch back at camp, we leave our desert island paradise and return to La Paz, via a colony of around 3000 wheezing Frigatebirds, providing wonderful photo-opportunities of these magnificent birds in flight. Within sight of the ‘mainland’ violent splashes announce the presence of a couple of Humpback Whales, which lay on a spectacular performance as the two youngsters frolic alongside one of our boats, with waving tails and breach landings which actually rock the boat with the ensuing tsunamis! This morning we leave La Paz and drive south west across the peninsula to the old town of Todos Santos, where the Tropic of Cancer meets the Pacific coast. A cultural tour introduces us to the history and architecture of the quaint town centre, with neat rows of low rise brick-built houses and a square facing the eighteenth century mission church. This afternoon we bird the local area, where our first sighting is a White-tailed Antelope Squirrel (with a stumpy grey tail) sitting on a fence post. The nearby coastal lagoon is very productive with Pied-billed and Black-necked Grebes, Great and Snowy Egrets side by side, just like in the fieldguide, plenty of Cinammon Teal, a couple of Lesser Scaup, American Wigeon and Coots, Black-necked Stilt, Long-billed Dowitcher, Least and Western Sandpipers in the same scope view, and Bonaparte’s Gull, with Lincoln’s Sparrow showing well in the adjacent reeds. Next we enjoy three Gilded Flickers on the top of the same dead palm tree stump, followed by a scintillating male Costa’s Hummingbird with a dazzling amethyst gorget, perched in the scope, along with close views of California Gnatcatcher and great scope views of Blue Grosbeak and a male Xantus’s Hummingbird with a black-tipped red bill and glistening green throat. Immediately after sunset a Lesser Nighthawk flies by making a nice end to another super day’s birdwatching, and to cap it all we enjoy a sumptuous gourmet dinner in The Hotel California! 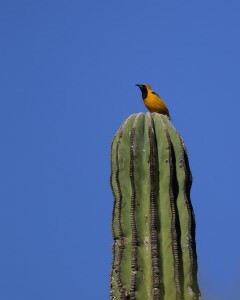 This morning we visit an oasis of palms on the coast, not far from Todos Santos, where we enjoy good views of Lesser Goldfinch, Gila and Ladder-backed Woodpeckers, Gilded Flicker, Western Scrub-Jay, Northern Cardinal, Blue-grey Gnatcatcher, Red-tailed Hawk and another stunning male Costa’s Hummingbird posing in the scope. The walk brings us to a wide stretch of sandy beach with lovely surf, ideal for a paddle, before staking out a damp rushy area for the elusive Belding’s Yellowthroat which eventually shows briefly for a lucky few in the group. After lunch we visit a rocky headland overlooking the sea with several whales spouting not far offshore, while a Zone-tailed Hawk descends to a cactus perch carrying a large freshly caught lizard, providing scope views of the ensuing meal. 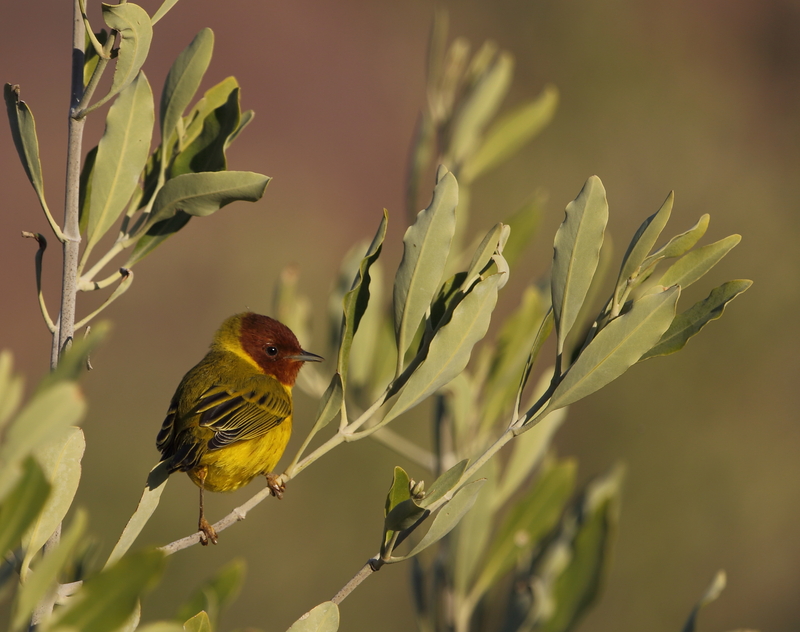 We also enjoy close views here of Gilded Flicker, Rock Wren, Black-throated Sparrows and a group of Hooded Orioles. 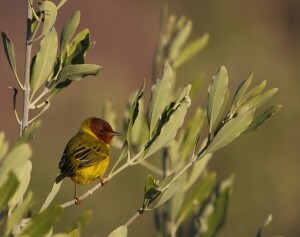 Back at the oasis, further notable sightings include California Gnatcatcher, Green-tailed Towhee and a Gila Woodpecker at its nest hole in a tall cactus. Straight after sunset, dozens of Lesser Nighthawks glide jerkily across the violet evening sky, allowing wonderful views of their barred patterns and white wing patches. It is easy to see why no one here suffers from S.A.D., as the sun is shining yet again, as we leave Todos Santos on a long drive north through a seemingly endless desert of thorny scrubland and magnificent tall Cardon Cacti, many of which are used as perches by Crested Caracaras, Red-tailed Hawks, American Kestrels, Gila Woodpeckers, Gilded Flickers, Northern Mockingbirds, Hooded Orioles, Loggerhead Shrikes and even Eurasian Collared Dove! As we approach the coast, numerous Ospreys look strangely out of place in such an arid landscape, especially when sitting on a cactus! In Puerto Lopez Mateos on the shore of Magdalena Bay, three occupied Osprey nests rest on telegraph poles within 100 yards of our hotel! 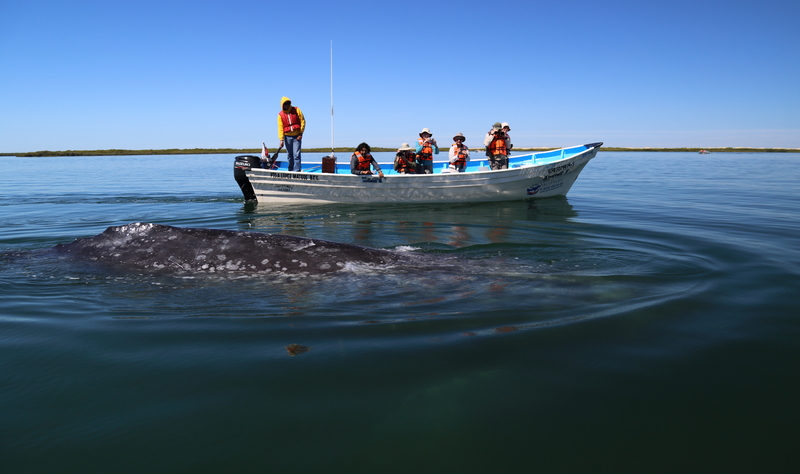 After lunch we have a ‘Panga’ ride on the sheltered bay, where many Grey Whales, measuring over 40 feet in length, arrive each winter to give birth to their 16 foot long babies! 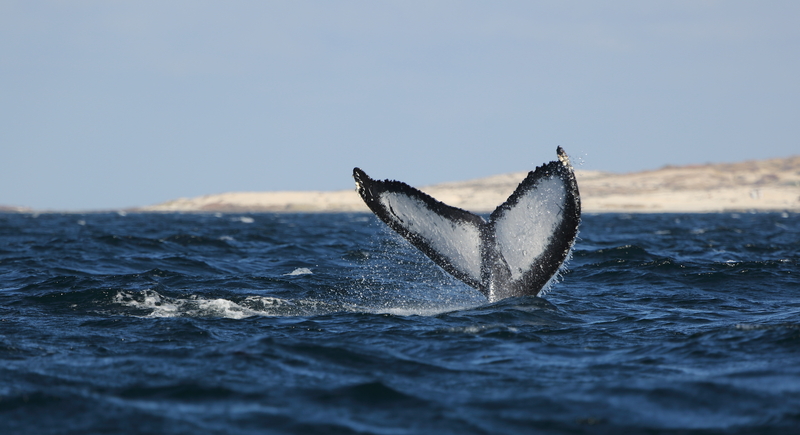 During the cruise, spouting whales keep popping up all around the bay, including several close encounters with mothers and calves. On the way back to the jetty, we spot Least Sandpiper and Dunlin amongst the Western Sandpipers and Semi-palmated Plovers, as well as Western Gulls, Black Brants, the Pochard-like Redhead and a distant Northern Harrier. Our Osprey neighbours are whistling before sunrise this morning, and all we have to look forward to today are three meals and two more boat rides to enjoy the whales! Within 15 minutes of leaving the jetty we have some serious ‘whale action’ on our hands with a mother and calf nuzzling up against the boat, so that we can actually reach out and touch these amazing creatures! Up close and personal, their muzzles have tufts of short bristles, and the mother’s rubbery skin is encrusted with clumps of large barnacles. This is another spectacular and memorable experience, but the whales appear to enjoy the interaction as much as their human playmates! Many whales later, on the way back to port, one whale performs a double breach clear of the water, with spectacular splash landings. After tasty fresh-caught fish for lunch we return to the boats for seconds, but our first sighting is of a group of elegant Western Grebes with spear like bills, followed by a lone Wilson’s Plover, like our own Ringed Plover, but with a longer heavier beak, and further along the same sandy shore a pack of three Coyotes are tucking into their freshly-caught Black-necked Grebe lunch. Sailing beyond the mouth of the bay, on a westward course for Hawaii, we are soon rocking and rolling in the breaking surf while surrounded by countless Grey Whales, snorting, spouting, rolling and tail-waving in all directions, with some even ‘spy hopping’, where they rise vertically clear of the swell to reveal a long bleached muzzle pointing skyward. 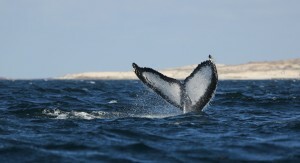 All this cavorting revelry seems to point to a speed dating centre for whales! Back at the hotel we enjoy a delicious lobster, prawn and fresh fish supper, while the whales will not get their next meal until they get back to Alaska! It’s our last ‘whale boat’ ride this morning, with a ringtail Northern Harrier hunting not far from the jetty. Early sightings from the boat include several Ospreys perched on branches washed up along the sandy shore, along with more Willet, Least and Spotted Sandpipers, Greater Yellowlegs, Marbled Godwit, Royal and Forster’s Terns, Brown Pelicans, Double-crested Cormorants and a Belted Kingfisher, plus four very obliging Coyotes and a couple of long-eared Jack Rabbits. 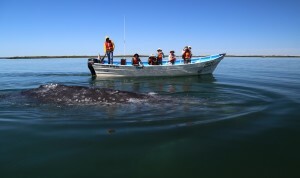 Further on we are once more surrounded by dozens of spouting Grey Whales, including many mothers and calves, all giving us the run around, as it seems impossible to anticipate their next moves. 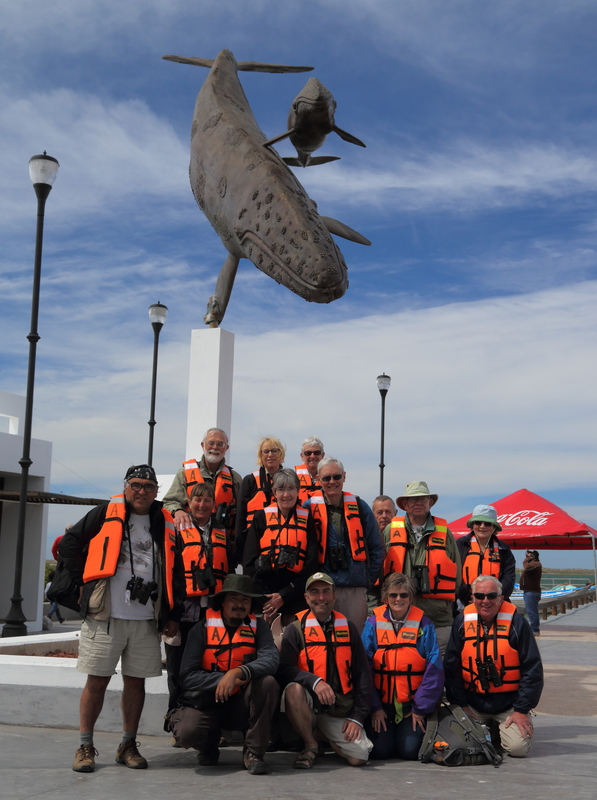 After a ‘whale of a time’ in Magdalena Bay it’s time to head back to La Paz for our last night in Mexico before flying home. No birding trip would be complete without a visit to the local sewage works and so we pay a visit to this fragrant site on our last morning. There are plenty of new sightings here with flocks of Brown-headed Cowbirds and Cattle Egrets, plus Blue-headed Teal, Black-bellied Whistling-Duck, White-faced Ibis, Killdeer, Monk Parakeet, Vermillion Flycatcher and American or Buff-bellied Pipit. Back in the van, our last sighting is remarkably well timed, as a Roadrunner dashes across the access road to the hotel and then back again, just as we return to pack for home! So, well done and thanks to Josele for arranging this grand finale to such a fantastic trip, with so many spectacular experiences!